The Haro 11 galaxy, packed with more than 200 different stellar nurseries, is revealed in a new composite photo from the Very Large Telescope in Chile and the Hubble Space Telescope. A frenzy ofstar birth has been captured in a new photo of a distant but extremelybright galaxy. Theastronomers created the new image by combining data from the ESO VeryLargeTelescope and the Hubble Space Telescope operated by NASA and theEuropeanSpace Agency. Haro 11 isthe second-closest Haro-type galaxy to Earth and is located 300 millionlight-yearsaway. Harogalaxies, named after astronomer Guillermo Haro (who discovered them in1956), arethose that emit unusually intense blue and violet light, whichtypicallyindicate a density of newborn stars or busy region known as an activegalacticnucleus. 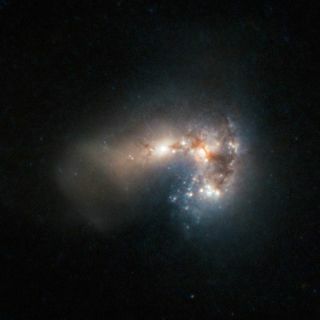 Haro 11 isknown as a starburstgalaxy,onewhich is undergoing intense star formation. It hasbeen around for about 40million years, but only began to peak in its birth of star clusters 3.5millionyears ago. The researchis detailed in a recent issue of the Monthly Notices of the RoyalAstronomicalSociety. "Withsuch an extremely young cluster population, Haro 11 represents a uniqueopportunity to investigate the youngest phase of the cluster formationprocessand evolution in starburst systems," the astronomers wrote in theirstudy. Most of thevery young, massive stars in Haro 11 are less than 10 million yearsold. Thehigh luminosity of the stars in the infrared (beyond red visible light)part ofthe spectrum has led astronomers to believe they have been caught whilestillemerging from their cloudy cocoons or birth sites. From this,astronomers deduced that Haro 11 is the result of the galactic mergerbetween ayoung, gas-rich galaxy and an older, star-rich one.